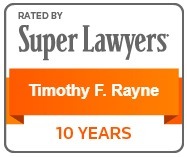 Tim Rayne is an experienced Personal Injury and Medical Malpractice attorney. For over twenty years, Tim has been helping people injured in accidents understand their legal rights and receive fair compensation from insurance companies. Tim has an advanced Master’s Degree in Trial Advocacy and is Board Certified by the National Board of Trial Advocacy. 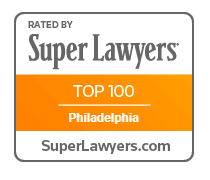 SuperLawyers has honored Tim as one of the Top 100 Lawyers in Philadelphia and Pennsylvania, and he has been listed by the National Trial Lawyers as a Top 100 Trial Lawyer. 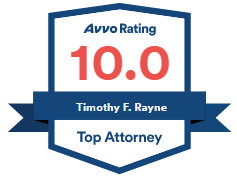 Tim has the highest AV Preeminent rating from Martindale-Hubbell and has a 10.0 “Superb” rating from AVVO. 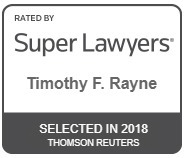 Since 2009, Tim has been recognized as a “Top Lawyer” in Personal Injury by Main Line Today Magazine and he is a member of the Million Dollar Advocates Forum. Tim regularly practices in Chester County with offices in Kennett Square and West Chester. Tim also helps clients with Personal Injury cases in neighboring counties including Bucks County, Delaware County, Lancaster County, Montgomery County and Philadelphia County. Car Accident – Chester County, PA – Settlement in excess of one million dollars for a client who sustained serious foot injuries following a broad-side collision between a Corvette and an SUV that failed to yield while turning left. Truck Accident – Chester County, PA – Settlement in excess of one million dollars when a car was rear ended by a tractor trailer resulting in neck injuries and surgery. Car Accident – Underinsurance Claim – Philadelphia, PA – Mediated settlement in excess of 1.5 million dollars for a client who sustained neurological injuries in a car accident. Car Accident Verdict – Chester County, PA – A broad-side collision resulted in neck and back injuries to client. Insurance company offered a low-ball settlement of $12,000. Chester County jury trial resulted in $50,000 verdict. Car Accident Verdict – Greensboro, NC – $4,250 Allstate Insurance Company offer was rejected and the jury verdict totaled $62,977.21. Medical Malpractice – Operating Room Fire – Cecil County, MD – Operating room fire resulted in first and second degree face and shoulder burns. The case resolved just before trial. Slip and Fall – Lancaster, PA – Tenant fell on steps at an apartment building due to a defective railing. The case settled for six figures prior to trial. Slip and Fall – Chester County, PA – Client slipped and fell in a McDonald’s restaurant due to wet tile floor without mats or warning signs. The case settled for $125,000. Nail Gun Injury – Federal Court – Philadelphia, PA – A construction worker who was seriously injured when a nail gun misfired and shot a three-inch nail into his chest. Legal claims were filed against the nail gun manufacturer alleging that the tool was defective and dangerous because it did not have a safety switch. The case settled prior to trial. Injured in an Accident – Who Pays My Medical Bills? Injured in An Automobile Accident? Who Will Pay Medical bills and Lost Wages? After contacting many of the attorneys you see on TV ads, I finally found the gem. I was involved in an accident which after I was transported by ambulance to the hospital, given an EKG and CT scan and released which took 4 hours. I didn't carry normal health insurance at the time of the incident. I later received a hospital bill for over $16,000.00. Despite explaining my situation, a motor vehicle accident that I was the NOT at fault party, every attorney I spoke to wanted to know what injuries I had sustained and what treatment I was pursuing. When I said thankfully, neither I nor the other party was injured, they all told me they weren't able to help and I would be responsible for that $16,000.00 bill. I did one more search on the computer and came across Mr. Timothy F. Rayne. Not only was he pleasant to work with, he personally reached me and gave me all the legal guidance to put this behind me almost a year after the initial accident occurred. This person is a great guy. He truly cares for his clients. If you are in need of an Attorney that deals with this type of law this is your guy. As I said in the beginning, a real gem. Thank you so much, Mr. Rayne. I consulted Tim on two accidents that I was involved in. He took on both of my cases. He was upfront, honest, and involved in every aspect. We were able to settle both of my cases out of court. Everything was handled by him and his staff in a professional manner. They worked with me from long distance and made everything easy and smooth. I am eternally grateful for the kindness and generosity they showed me. I recommend Tim without reservation. Tim Rayne and I recently completed a 'trip and fall' lawsuit. I have never been in any litigation before. It is a lengthy procedure but Tim assisted me in understanding the step by step process and counseled me on my role in the litigation. I found him to be extremely knowledgeable of the law down to the letter. He is professional and well spoken. Do not let his mild manner fool you. He is well prepared and when he defends he changes into an aggressive defender of his client. I would recommend Tim if you need a real pro who gets results. Tim was referred by a friend of my brother. He came to my home as soon as I called him about my car accident. I was hit by a car while I was crossing the street. The driver ran a stop sign while I was in the crosswalk. Tim is the constant professional and is very informative. Tim explained the entire process to me and assured me that he was going to see that my health was okay and that I was compensated. He is honest, upfront and was in my corner every step of the way. In the end, I received a large cash settlement and I was very happy with the results. I would recommend Tim to anyone dealing with a car accident.